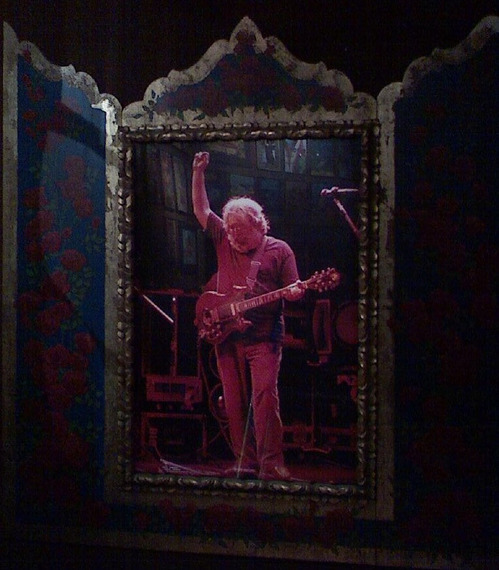 Tonight I had the pleasure of seeing Hot Tuna performing acoustically at the legendary Fillmore in San Francisco. 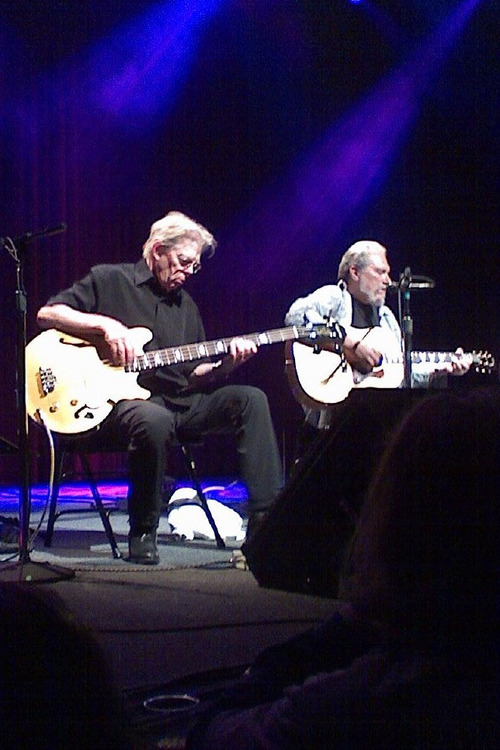 Hot Tuna was a "side project" started in the 60's by long-time friends, Jorma (pronounced "Yorma") Kaukonen (guitar) and Jack Casady (bass) who were then members of the psychedelic San Francisco rock band, The Jefferson Airplane. Jorma and Jack grew up together in Washington DC. Their musical roots were in blues, bluegrass, jazz and folk music, which the two friends played together every chance they got -- when on the road with The Jefferson Airplane, and at home, even performing their style of music at "side gigs" after Jefferson Airplane concerts. Since those days, they have produced more than two dozen records and performed electrically and acoustically all over the world, and with a variety of other wonderful musicians. Jorma and Jack have played together for so long that their music just seems to "fit" together. Not only are the sounds coming out of their instruments absolutely amazing, but watching them play (thanks to my vantage point right up front!) was almost like watching a well-choreographed dance, and added so much to my enjoyment of the music. 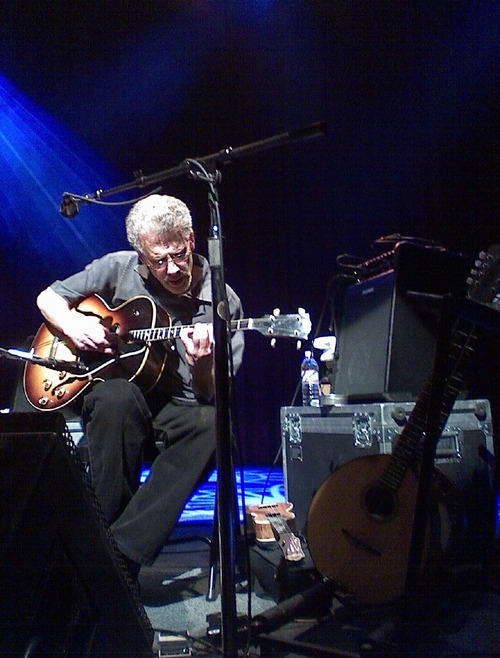 For several years Jorma and Jack have included mandolin player, Barry Mitterhoff, who plays other instruments as well, in their acoustic performances. While I think of the mandolin as being very bluegrass-y, Mitterhoff plays the instrument very differently ... a perfect fit with Jorma and Jack's eclectic mix of blues, bluegrass, jazz and folk. What a delight! Just the three superb musicians on the stage, treating the very-appreciative audience to two sets of some of the most beautiful, intricate, finger-pickin' music you can imagine. The tie-dye-clad crowd was mellow and friendly, and the music was just exceptional. Interestingly, just a little over 40 years ago (June 20, 1967), The Jefferson Airplane and Jimi Hendrix shared the stage at The Fillmore. If you "Google" the best guitarists and best bass players of all time, you'll find Jorma and Jack's names. They just performed at Bonnaroo, and their current tour continues in July into the Pacific Northwest and Alaska, Colorado and Utah before heading to the east coast. 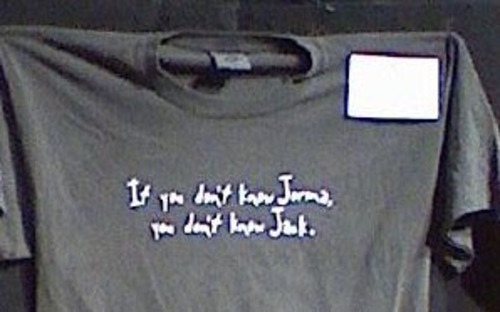 I hope you'll have a chance to see San Francisco rock music royalty, Jorma Kaukonen and Jack Casady perform one day because as the t-shirt says ... "If you don't know Jorma, you don't know Jack!" Really enjoyed your background info on Jorma and Jack, past concert memories and the coverage of the concert and venue ambiance. Thanks! Nice job. I'm sure it rocked! Good job and very informative. In some sense you gave me a picture in my mind of the concert. 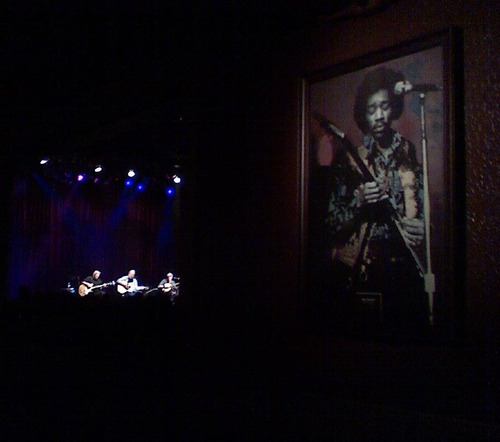 I liked the pic from the bar with Jimmy Hendrix.You rock Ossieboo. Keep up the good work, Lesley. I grew up in the bay area during the '70s and can remember these bands playing at Winterland, Fillmore and Day on the Green. Thanks for the flashbacks. GREAT AND INFORMATIVE REVIEWS! THANKS FOR THE MEMORIES!! WOW THIS LADY DOES A GREAT JOB! ARE YOU SURE SHE HAS NOT DONE SOME REVIEWS AND PROFESSIONAL PICTURES BEFORE? You write with color, expression, and great visuals. gotta love the name hot tuna!!!!!!!!!!! Very good review. Great writing. Lesley has a career cut out for her writing descriptions and using fantastic phrasing to do so.